Gallery Mozelle in Deer Isle will host an artists’ reception on Sunday, August 5, from 2 to 5 p.m., for its fourth show of the season, “Sarah Doremus: On and Off the Wall,” featuring wearable art, “Medals to honor our anxieties,” by Doremus of Deer Isle. Doremus is known for her unique jewelry, which speaks to many aspects of our daily lives—from politics to anxieties. The gallery also features ceramic artists from the U.S. and Canada, including Deer Isle’s Marcia Kola; hand-blown glass, hand-forged utensils by Erica Moody; jewelry by Farr, Stacy Hopkins, Christine Peters, and Wendy Jo New; unique felted hats by Pat White of Deer Isle; hand-stamped table linens and tea towels; and paintings and Maine landscape photography by Cynthia Farr-Weinfeld of Portland. The show runs through August 31. The gallery will be open Monday through Saturday, 11 a.m. to 5 p.m. or by appointment. It is located at 5 Main Street in Deer Isle. For information, call 460-2329, email farr.maureen@gmail.com, or visit gallerymozelle.com. 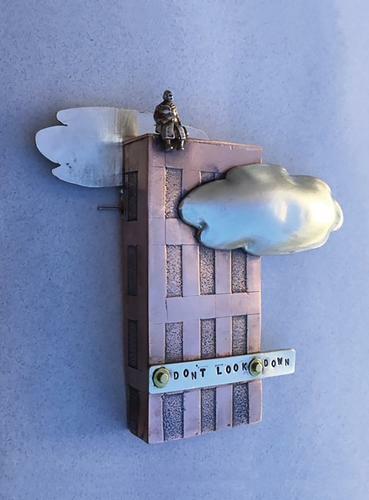 Pictured is “Don’t Look Down,” a medal to honor our fear of heights by Sarah Doremus, is part of the “On and Off the Wall” show at Gallery Mozelle in Deer Isle.